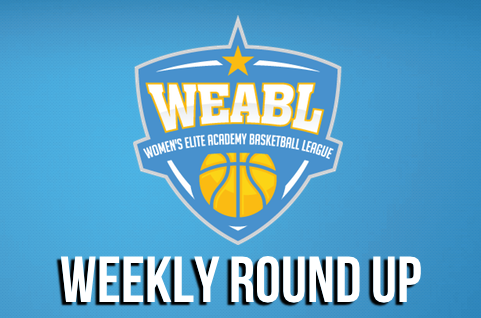 In the Week 14 action of the WEABL, four games got underway including an exciting overtime thriller between CoLA and Copleston and Oaklands College receiving their first win of the season, as the last weeks of play approach. Barking Abbey got an important home victory in the WEABL on Wednesday afternoon, defeating John Madejski Academy 59-47. 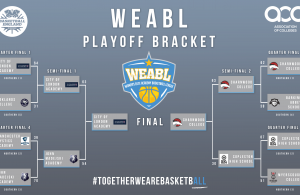 The win combined with other results in the competition sets up an interesting end to the season in the WEABL with the top four positions still up for grabs with all teams. A strong first half from Barking Abbey saw them hold a 39-28 interval at the break which they backed up with a 16-6 third quarter. Loren Christie led the third quarter run with 12 points, as Barking Abbey got a lead they held onto despite a good comeback from JMA. Seven points in the fourth quarter from Paula Romero then brought the guests closer, but BA held on for the win. Loren Christie finished with 24 points to lead Barking Abbey with Jolicia Cadogan (14) and Precious Adediran (12) also reaching double figures. For JMA Romero finished with 14 points, and she was helped by 10 from Anabel Latorre and 10 from Angelique Villa-Cua. City of London Academy squared off against undefeated Southern Conference front runners Copleston High School on Wednesday afternoon in what proved to be an instant classic for the packed crowd of over 150 students at CoLA, with home side just hanging on for an overtime victory 82-76. In a nip and tuck first half both teams really seemed to be feeling each other out, CoLA took a narrow five point lead into the break, although the warning signs were there for the home team as U18 GB international Esther Little led all scorers with 18 points at the half. The half saw CoLA open up a 13 point lead at one point only for Little and sharp shooting Charlotte Redhead to pull the visitors right back into the game with the scores tied going into the last two minutes. 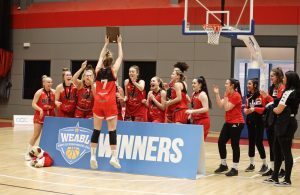 Both teams had chances to win the game in the final 20 seconds, notably a buzzer beating three from Becky Harwood-Bellis rattled in and out to leave the home crowd stunned but seemingly relieved. Oaklands College received their much awaited first win of the season on Wednesday afternoon after beating Itchen College. In a year of development for both programs, the current Oaklands College roster showed their improvement as they moved past Itchen College in well fought game by both outfits. Itchen having knocked out Oaklands in the cup earlier this campaign, opened the game confidently and held a narrow 14-12 lead to end the first period. Oaklands grew in the game and started to sure up the defensive end which led to two scoring runs of 6 and 8 points unanswered which gave them a 27-23 half time advantage.The second half was led by Oaklands throughout, however in a game with only 4 made three point shots (all by Oaklands) it remained a close contest until the last 3 minutes of the game when Oaklands managed to push their advantage out to double digits. Charnwood College Riders defeat Myerscough 87 – 60. The final league game between Charnwood and Myerscough saw a high scoring affair with both teams shooting the ball well. The game was up and down for the majority and saw Charnwood take the early lead. However, Myerscough cut the lead back with the first quarter finishing 15-12 to Charnwood. After multiple defensive stops and strong shooting it saw Charnwood go up by 17 going into half time. The second half was much of the same, however hot fire shooting late from Myerscough ensured their win in the final quarter. Charnwood’s top scorers were Holly Winterburn with 36 points, Holly Wright 14 and Imogen with 10. Myerscough were led by Jess McGrath’s 13 points and Simpson’s 10.